Choledochal cyst is a rare but potentially serious disease with a wide spectrum of presentation. The definitive treatment is an ultra-major operation aiming at complete cyst excision and reconstruction with a hepatico-jejunostomy. In current years, we have applied the laparoscopic technique in this condition. A retrospective review was carried out on our experience in the past 20 years. In the series, there were 75 patients, with laparoscopic surgery attempted in 39 and successfully performed in 36. Of the 75 patients, postoperative complications included intra-abdominal collections (8), bile leak (5), and postoperative small bowel intussusception (1). At a median follow-up of 7.5 years, 10 patients had encountered problems including adhesive small bowel obstruction (4), cholangitis (3), pancreatitis (1), requirement for liver transplant (1) and one mortality due to an unrelated problem. In conclusion, with appropriate management, a good outcome can usually be achieved but long-term follow-up is required for possible late problems. Choledochal cyst is a congenital dilation of the bile duct. It is a rare but serious disease in childhood. The incidence is around 1 in 15000 live births but it is more common in Asian countries.1,2 The presentation can be quite diverse from an incidental finding on antenatal screening to jaundice, acute abdominal pain, cholangitis or even rupture. It is important to have a high index of suspicion so as to unveil the condition early and hence early surgical treatment can be contemplated. We herein review our twenty-year experience in the management of this rare disease. A retrospective review was conducted in all paediatric patients with a choledochal cyst treated between December 1988 and December 2008 by the Division of Paediatric Surgery & Paediatric Urology, Prince of Wales Hospital. The diagnosis of choledochal cyst was established by either ultrasonography, computer tomography or more recently by magnetic resonance cholangiography (MRC) (Figure 1). In those presenting with acute symptoms, they were tided over the acute episodes before definitive surgical intervention. In those whose acute inflammation did not settle on conservative treatment, an endoscopic retrograde cholangiopancreatogram (ERCP) with/without a papillotomy would be performed (Figure 2).3 For type I choledochal cysts,4 the standard treatment is complete cyst excision and reconstruction with a hepatico-jejunostomy in Roux-en-Y manner. The similar principle was applied to type IVa cysts initially but a more radical excision of the bile duct to the hilum was performed. The Lilly's mucosectomy5 would be used if the cysts were densely adhered to the adjacent vascular structures making complete excision unsafe. Before 2000, the operation was performed by the open approach via a right upper quadrant incision. Since 2000, the laparoscopic technique has been used routinely. The epidemiological data, information on choledochal cysts, the presentation, treatment and outcome were reviewed. Figure 1 Examples of MRC showing type I cysts and a type IVa cyst. The MRC showed the pancreatic duct, bile duct and the common channel clearly in the type I fusiform cyst but not in the cystic type I cyst. Figure 2 An ERCP film demonstrating the anatomy clearly. Patients were placed in the supine position. An infra-umbilical incision was made and a 5 mm laparoscopic port was inserted through the open Hasson's technique.6 Carbon dioxide pneumoperitoneum was established between 8-15 mmHg according to the patient's size. A 5 mm 30o laparoscope was used. Another three 5 mm laparoscopic ports were then inserted under laparoscopic guidance into the upper abdomen (Figure 3). An intra-operative cholangiogram would be performed in those without a good preoperative cholangiogram by injecting contrast solution into the gall bladder via a needle puncture. The gall bladder was first dissected from the liver. 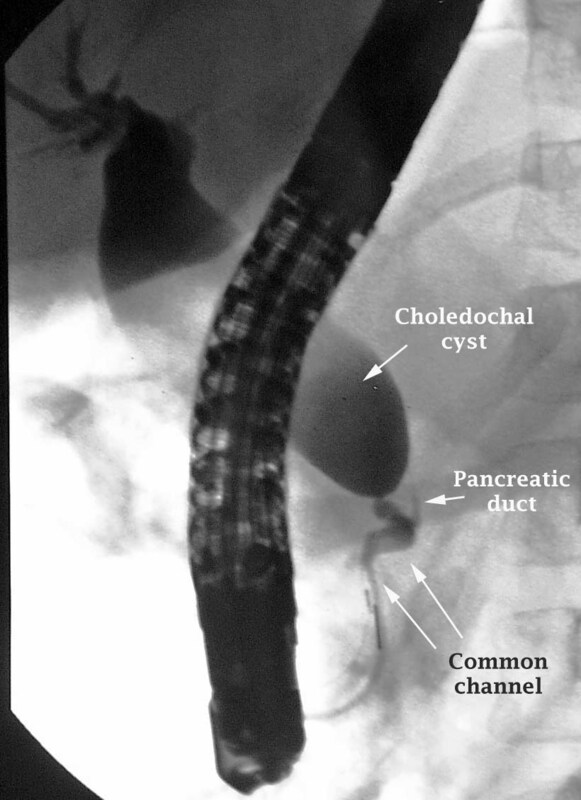 The choledochal cyst was then meticulously mobilised from the duodenum, pancreas, portal vein and the hepatic arteries using scissors and cautery (Figure 4). The tapered end of the cyst/common bile duct was transected and ligated just proximal to the common channel with the pancreatic duct. The operation was then switched to the proximal dissection of the cyst to the level of the normal bile duct, at this level transaction being performed (Figure 5). If necessary, the transaction may be sited at the bifurcation of the right and left hepatic ducts. The intrahepatic ducts were examined and flushed with saline solution to clear the sludges or stones if any. The cyst was then retrieved through the umbilical port site. The proximal jejunum was selected and brought out to the abdominal surface through the enlarged umbilical port site. The pneumoperitoneum was released and a 40 cm Roux-en-Y jejunal loop was fashioned with the blind end closed and an end-to-side jejuno-jejunostomy extracorporeally. The jejunal Roux loop was then returned to the abdominal cavity and pneumoperitoneum was re-established. The jejunal Roux loop was brought to the hilum and anastomosed to the bile duct using laparoscopic hand-suture technique using fine sutures (Figure 6). A small drain was left in the region at the end of the procedure. Over a 20-year period, there were 75 patients (54 girls) included into the study. The age at diagnosis ranged from 0 month to 16 years (mean 3.8 years). Seventy percents of patients presented with acute symptoms (Table 1). According to the Todani's classification (Table 2) ,6 there were 72 type I cysts (38 cystic and 34 fusiform) and 3 type IVa cysts. The diameter of the cysts ranged from 0.6 cm to 13 cm (mean 3.4 cm). An ERCP was performed in 25 patients (Table 3). 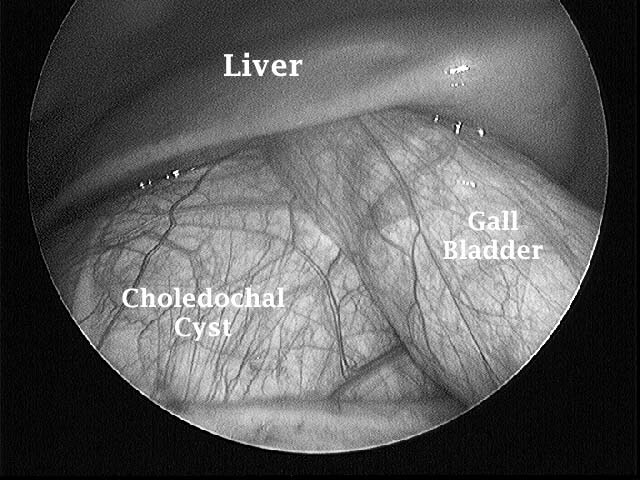 Figure 3 The laparoscopic view showing the distended gall bladder and the large choledochal cyst. 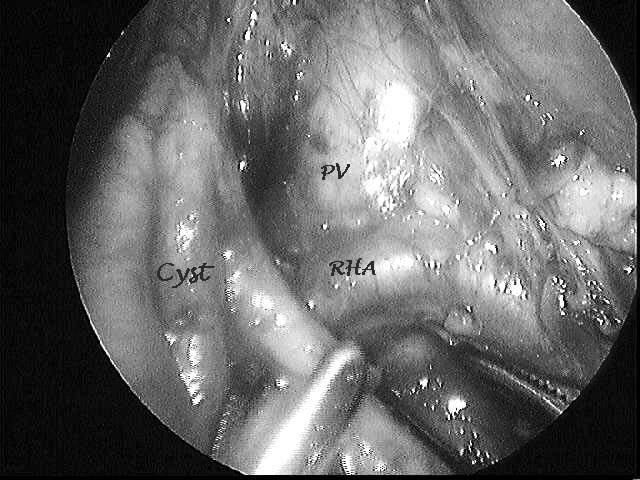 Figure 4 Laparoscopic view showing the cyst, the right hepatic artery (RHA) and the portal vein (PV). Figure 5 The transected end of the common hepatic duct (outlined by white arrows). Figure 6 Laparoscopic view showing the completion of the hepatico-jejunostomy (white arrows). Open excision was performed in 36 patients. Laparoscopic excision was attempted in 39 children and was successfully performed in 36. Conversion to open surgery was required in 3 patients during the early part of the series due to difficult dissection (2) and bleeding from the fashioning of the jejunal Roux loop (1). Total excision of the cyst was accomplished in 67 patients while 8 required mucosectomy. The anastomosis was fashioned at the common hepatic duct in 61 and at the bifurcation of the right and left hepatic ducts in 14 patients. Early postoperative complications included bile leak in five, 2 of which sealed off on conservative treatment while 3 required re-exploration (Table 4). Subhepatic collection was identified in seven patients including chylous ascites in 1. All but one responded to conservative treatment while aspiration under ultrasonography was required in the other. One patient had an infected haematoma at the mucosectomy site and required re-exploration and evacuation of blood clots 1 week after surgery. One patient developed postoperative small bowel intussusception that required surgical intervention. At a median follow-up of 7.5 years (Range: 1 month to 20 years), 10 patients had major problems including adhesive intestinal obstruction (4), cholangitis (3), pancreatitis (1), requirement for liver transplant (1) and mortality (1) (Table 5). Eight patients had some degree of fat intolerance that responded to conservative treatment. All the patients had good cosmetic results after laparoscopic excision. Detailed follow-up information was not available in 8 patients due to loss to follow-up. Choledochal cysts have a wide range of presentation contributing to the diagnostic challenge in some of these patients.1,7,8,17 In the series, there were 4 patients diagnosed on antenatal screening. With the improvement in antenatal care, it is expected there will be more patients diagnosed by antenatal ultrasonography. Overall, the majority of patients present acutely with abdominal pain with or without cholangitis at young ages.1,7,8,17 In the series, the mean age at presentation was 3.8 years and 69.3% presented acutely with acute abdominal pain and about 40% of these also had the features of cholangitis. It is important to realise that actually more than half of those presenting with acute abdominal pain had similar episodes in the preceding months without proper assessment before the referral. In these patients, the liver function tests might be entirely normal. However, the serum amylase was commonly elevated and this, together with the recurrent history, should raise the index of suspicion and point for more comprehensive investigations. Given the rarity of the disease and non-specific symptoms in the majority of these young patients, a high index of suspicion is mandatory to avoid unnecessary delay in the diagnosis. Ultrasonography has been an invaluable screening test for choledochal cysts. However it is not very good in showing up the exact anatomy and, in recent years, the MRC has been found to be useful in assessing the hepatobiliary pathologies in children.21 It may provide a much better road map on the anatomy than ultrasonography. However, its use may still be limited in small kids as it may not be able to show up the pancreatobiliary junction clear enough to facilitate the subsequent definitive surgery. If a clear image of the anatomy is not available preoperatively, an intraoperative cholangiogram to define the exact anatomy is mandatory. When patients present acutely with abdominal pain, cholangitis or obstructive jaundice, the initial treatment aims at tiding over the acute episodes. They are kept nil per oral and prescribed with antibiotics in those with cholangitis. If the response is unsatisfactory, we prefer an ERCP with or without a papillotomy to relieve the protein plug obstruction at the common channel.3 In expert hands, this can be done safely and effectively leading to the subsidence of acute inflammation. In the series, an ERCP was attempted in 1/3 of the patients with a success rate of 92%. This is preferred to percutaneous transhepatic biliary drainage (PTBD) as this only serves a temporising measure to relieve the obstruction but is unable to handle the protein plugs at the common channel; the persistence of such may lead to future problems. Apart from its therapeutic role, the ERCP will also give a very clear view on the anatomy in particular the relationship between the distal end of the bile duct and the pancreatic duct. This is extremely helpful for the subsequent surgery. It is still controversial about the exact timing for surgery in asymptomatic infants with antenatal-diagnosed cysts.22,23 There have been advocates for early surgery as there was evidence that, while on observation, the cyst increased in size or even developed complications such as acute inflammation or even rupture.22-24 There is also the potential risk of hepatic fibrosis in those with delayed surgery. Yet one has to balance other patient factors such as gestational age, body weight and other coexisting medical problems before the decision for the most appropriate timing for surgery. On the other hand, it is important to realise that in those neonates with antenatal-diagnosed cysts and coexisting obstructive jaundice, it could be the cystic variant of biliary atresia instead.19,20,25 Under such circumstances, it is imperative to have an early operation as it is well known that biliary atresia carries a much better outcome with early surgery. For the majority of patients who present with features secondary to acute inflammation or obstruction, they are tided over the acute episodes before the definitive surgical intervention. If the initial response is unsatisfactory, the endoscopic treatment as described will be instituted. Definitive surgery will be performed in a few weeks' time when acute inflammatory changes settle. The basic principle is to excise the entire dilated extrahepatic bile duct without damaging the adjacent vital structures such as the portal vein, the hepatic artery, the pancreas and its duct and the duodenum. The cyst could be quite densely adhered to the surrounding structures in particular in those with previous acute inflammation and in those older children with more longstanding chronic inflammation. The different types of anatomical variants of the hepatic arteries and the bile duct also increase the difficulty of surgery. It is of utmost importance to have meticulous dissection to avoid the damage to these vital structures. In those cases with dense adhesions between the cyst and the important vascular structures, the Lilly's mucosectomy will be required.4 This was indeed necessary in about 10% of the cases in the series. However, it is expected to have more oozing after mucosectomy when the dissection goes through the inflamed wall. This might account for the postoperative haematoma encountered in 1 patient in the current series. It is essential to have complete excision of the cyst as incomplete excision will lead to future problems of infections, strictures, stone formation, pancreatitis or even, malignancy. The distal part has to go all the way to just short of the junction with the pancreatic duct. It is invaluable to have a detailed road map on the anatomy by a preoperative ERCP, MRC or an intraoperative cholangiogram. This is particularly important in those fusiform type I cysts in that it may not be easy to delineate the junction with the pancreatic duct. Inadequate dissection may lead to future problem such as stump pancreatitis as in one of our patients while too distal dissection may damage the pancreatic duct. It is also important to clear up the protein plugs/sludges at the common channel before closure of the ductal opening. For the upper margin of transaction, it is usually chosen at the site of the common hepatic duct well proximal to the cyst and a wide anastomosis is advocated to avoid subsequent stricture formation. If the common hepatic duct is abnormal with strictures, the dissection has to be more radical with the dissection to the level of the bifurcation of the right and left duct with or without stricturoplasty to avoid the future development of strictures and stones. 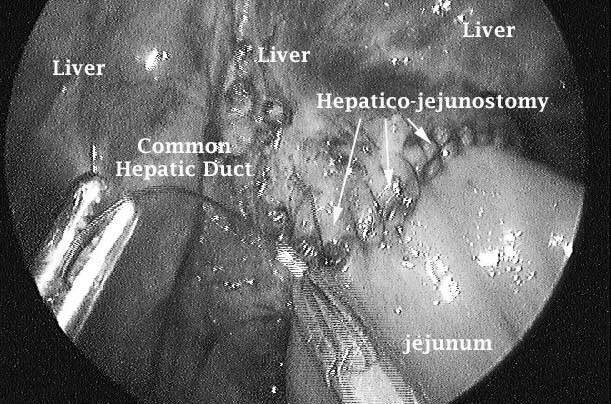 It is also important to ascertain the clearance of stones or sludges in the intrahepatic ducts, the remains of such will invite future troubles.26 Todani et al27 has been the strong advocate for the more radical excision and hilum anastomosis to avoid the subsequent strictures but Miyano has suggested that hepatico-jejunostomy was usually sufficient while a wide hilum anastomosis would be needed only in selected cases.26 We concur with the approach as suggested by Miyano as a more radical approach would definitely increase the difficulty of surgery and its potential complications. In the series, about 23% of our patients did require more proximal dissection and hilum anastomosis. The principle of the initial treatment of type IVa cysts follows that of type I cysts though more radical excision to the hilum is essential. Through our experience in using the laparoscopic technique in the whole spectrum of diseases in children, we have found that it is imperative to have good planning in the surgery including every minor detail. The appropriate positioning of patients, good choice of port sites, appropriate equipments and set-up and last but not the least the close cooperation with the anaesthetists are prerequisites for smooth surgery. As the operative field could be quite wide, the well-planned set up including the port sites allows the smooth shifting of the camera and working ports and hence facilitates the cyst excision and the biliary reconstruction. Despite the clinical resolution of infection and acute inflammation, the cyst can still be quite inflamed and vascular. This makes the dissection particularly difficult that may result in the vicious cycle of excessive oozing, obscured operative field, difficult haemostasis and more bleeding. It is important to realise that we have to be patient and meticulous in the operation to prevent excessive oozing and allow smooth and safe surgery. We have shown that, in the absence of significant oozing, the magnification of the camera head of the laparoscope actually provides a very clear view that adds to the safety of dissection and avoids the damage to the vital structures around the choledochal cyst. A long learning curve was indeed observed. However, once we have overcome the obstacles, the surgery, though still difficult, can be performed smoothly and safely. For the reconstruction, we prefer the hepatico-jejunostomy in Roux-en-Y fashion as advocated by Prof Miyano.46 Though this involves more surgical steps, it is preferred to hepatico-duodenostomy that has possibly a higher incidence of ascending cholangitis and biliary gastritis.46 For the construction of the jejunal Roux-en-Y loop, different methods have been described in the literature including the use of staples for the bowel anastomosis to overcome the difficulty in intra-corporeal bowel anastomosis with laparoscopic suturing. However this carries a higher chance of intra-abdominal contamination with bowel contents and the use of staplers also incurs a higher cost. We favour the fashioning of the jejunal Roux-en-Y loop extracorporeally through the enlarged umbilical port site rather than doing it inside by either suturing or stapling.33,36,45 Our extracorporeal method has the advantages of allowing meticulous bowel anastomosis as in the open method, minimising intra-abdominal contamination and avoiding the use of staples. As the incision to enlarge the umbilical port site follows the skin crease of the umbilicus, the cosmetic result is universally good. After such an ultra-major operation, we did encounter some complications, the incidence of which was comparable to that in the literature. The bile leak rate of 6.7% in the whole series is comparable to that of around 2.5-18% in traditional open surgery.8,26,49 Like those reported from the literature, the majority of the leak will seal off spontaneously. However, persistent leak demands an early re-exploration. In the series, re-exploration was required in 3 patients, 1 in the laparoscopic group. 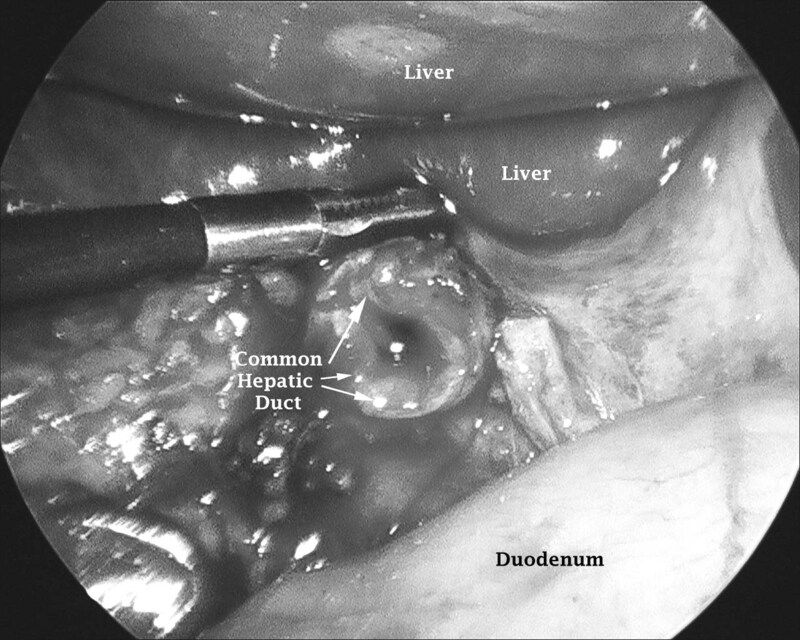 At exploration, the bile leakage was found at the hepatico-jejunostomy anastomosis in 1 patient but unexpectedly at the proximal bile duct in 2 patients. This might be related to damage from the excessive use of cautery to control the troublesome oozing in these patients who had the history of severe inflammation requiring endoscopic treatment. To avoid this complication, extra precaution has to be taken when using those powerful haemostatic devices. It was quite unexpected that there were more intra-abdominal collections in the laparoscopic group. It was fortunate that most of these did not require surgical intervention. It is not certain at this stage whether the use of abdominal drains and the practice of more thorough irrigation at the end of the procedure will bring down the incidence. All these patients require regular follow-up as it is well known that strictures and intrahepatic duct stones with or without cholangitis may occur at an incidence from 2.3% to 10.3% even more than 10 years after surgery.26,27,49,50 In the series, there were 2 patients (2.7%) presenting as cholangitis at 4 years after surgery and were found to have anastomotic strictures. Strictures formation is much more prevalent in those with type IVa cysts, in those with postoperative biliary complications such as leakage and in older children with more chronically inflamed cyst walls.26,51 When patients develop cholangitis, detailed assessment of the biliary system with a MRC for strictures is required. These strictures usually respond to percutaneous balloon dilation and stenting However, in those type IVa cysts, further surgical intervention is usually required. If the ductal dilation is only limited to a single lobe of liver, lobectomy may cure the problem but if it is diffuse, liver transplant would be required as it is well known that malignancy will develop under such situation. We have in the series 1 patient who had liver transplant at 10 years after the initial excision of the extrahepatic choledochal cyst. Pancreatitis with or without protein plugs has been described after the excision of choledochal cysts.52,53 This may be related to the preceding pancreatic ductal problem or residual sludges left over from the initial surgery.51 A thorough assessment of the cyst and the bile duct with adequate irrigation to clear up the sludges is important to prevent this occurrence. We did encounter one case in the series that required endoscopic and then surgical treatment to remove the remnant of the bile duct lying within the pancreatic head. Intestinal obstruction due to adhesions is another postoperative problem not uncommonly encountered. We have 4 patients (5.3%) who developed intestinal obstruction at a few weeks to many years after the excision of choledochal cysts. It is as expected that the chance of developing adhesive intestinal obstruction is lower after laparoscopic than open surgery (2.7% vs 7.7% in the series). Parents should be warned about this and advised to seek medical attention early if problems arise. though the exact incidence is uncertain.54,55 It was estimated by Todani to be around 0.7%, i.e., a figure well above that of the general population.54 It is expected that the incidence in children may be lower than that in adults as the duration of chronic inflammation is expected to be shorter in children. From his review, the occurrence of malignancy in children was more than 10 years while that for adults could occur within very short time interval after the initial excision of choledochal cysts. This emphasizes the importance of the awareness of the problem with early and proper surgery and regular follow-up. We have encountered fat intolerance, an under-reported problem in the literature, in 8 patients. They had certain degree of abdominal pain and loose stool after fatty food. With diet manipulation and, with time, they all improved subsequently and could almost tolerate normal diet. Choledochal cyst disease is a rare congenital condition that can present with different symptoms and at different ages. A high index of suspicion is thus required. The definitive treatment is the complete excision of the cyst. With experience, the surgery can be performed by the laparoscopic technique effectively and safely with universally good cosmetic result. Regular follow-up is required as complications like cholangitis, strictures and even malignancy may occur. 1. Lipsett PA, Pitt HA. Surgical treatment of choledochal cyst. J Hepatobiliary Pancreat Surg 2003;10:352-9. 2. Yamaguchi M. Congenital choledochal cyst. Analysis of 1,433 patients in the Japanese literature. Am J Surg 1980;140:653-7. 3. Houben CH, Chiu PW, Lau J, et al. Preoperative endoscopic retrograde cholangiopancreatographic treatment of complicated choledochal cysts in children: a retrospective case series. Endoscopy 2007;39:836-9. 4. Todani T, Watanabe Y, Narusue M, Tabuchi K, Okajima K. Congenital bile duct cysts: classification, operative procedures, and review of thirty-seven cases including cancer arising from choledochal cyst. Am J Surg 1977;134:263-9. 5. Lilly JR. The surgical treatment of choledochal cyst. Surg Gynecol Obstet 1979;149:36-42. 6. Hasson HM. Open laparoscopy: a report of 150 cases. J Reprod Med 1974;12:234-8. 7. Stringer MD, Dhawan A, Davenport M, Mieli-Vergani G, Mowat AP, Howard ER. Choledochal cysts: lessons from a 20 year experience. Arch Dis Child 1995;73:528-31. 8. Edil BH, Cameron JL, Reddy S, et al. Choledochal cyst disease in children and adults: a 30-year single-institution experience. Am Coll Surg 2008;206:1000-5. 9. O'Neill JA Jr, Templeton JM Jr, Schnaufer L, Bishop HC, Ziegler MM, Ross AJ 3rd. Recent experience with choledochal cyst. Ann Surg 1987;205:533-40. 10. Babbit DP. Congenital choledochal cyst: New etiological concept based on anomalous relationships of common bile duct and pancreatic bulb. Ann Radiol 1969;12:231-40. 11. Todani T, Watanabe Y, Fujii T, Uemura S. Anomalous arrangement of the pancreatobiliary duct system in patients with a choledochal cyst. Am J Surg 1984;147:672-6. 12. Todani T, Akita E, Ito T. (The Japanese Study group on Panncreatobiliary Maljunction) Diagnostic criteria of pancreatobiliary maljunction. J Hep Bil Pancr Surg 1994;1:219-21. 13. Davenport M, Stringer MD, Howard ER. Biliary amylase and congenital choledochal dilatation. J Pediatr Surg 1995;30:474-7. 14. Pushparani P, Redkar RG, Howard ER. Progressive biliary pathology associated with common pancreatico-biliary channel. J Pediatr Surg 2000;35:649-51. 15. Ito T, Ando H, Nagaya M, Sugito T. Congenital dilatation of the common bile duct in children - the etiologic significance of the narrow segment distal to the dilated common bile duct. Z Kinderchir 1984;39:40-5. 16. Ando H, Kaneko K, Ito F, et al. Surgical removal of protein plugs complicating choledochal cysts: Primary repair after adequate opening of the pancreatic duct. J Pediatr Surg 1998;33:1265-7. 17. Miyano T, Yamataka A. Choledochal cysts. Curr Opinion Pediatr 1997;9:283-8. 18. Davenport M, Betalli P, D'Antiga L, Cheeseman P, Mieli-Vergani G, Howard ER. The spectrum of surgical jaundice in infancy. J Pediatr Surg 2003;38:1471-9. 19. Caponcelli E, Knisely AS, Davenport M. Cystic biliary atresia: an etiologic and prognostic subgroup. J Pediatr Surg 2008;43:1619-24. 20. Lal R, Prasad DK, Krishna P, et al. Biliary atresia with a "cyst at porta": management and outcome as per the cholangiographic anatomy. Pediatr Surg Int 2007;23:773-8. 21. Fitoz S, Erden A, Boruban S. Magnetic resonance cholangiopancreatography of biliary system abnormalities in children. Clinical Imag 2007;31:93-101. 22. Dundas SE, Robinson-Bridgewater LA, Duncan ND. Antenatal diagnosis of a choledochal cyst. Case management and literature review. West Ind Med J 2002;51:184-7. 23. Lugo-Vicente HL. Prenatally diagnosed choledochal cysts: observation or early surgery? J Pediatr Surg 1995;30:1288-90. 24. Siddiqui MM, Grier D, Cusick E. Postnatal rupture of an antenatally diagnosed choledochal cyst: first case report. Acta Paediatrica 2006;95:115-7. 25. Okada T, Sasaki F, Ueki S, et al. Postnatal management for prenatally diagnosed choledochal cysts. J Pediatr Surg 2004;39:1055-8. 26. Miyano T, Yamataka A, Kato Y, et al. Hepaticoenterostomy after excision of choledochal cyst in children: a 30-year experience with 180 cases. J Pediatr Surg 1996;31:1417-21. 27. Todani T, Watanabe Y, Urushihara N, Noda T, Morotomi Y. Biliary complications after excisional procedure for choledochal cyst. J Pediatr Surg 1995;30:478-81. 28. Tan HL. The role of laparoscopic surgery in children. Ann Chir Gynaecol 1994;83:143-7. 29. Lee KH, Yeung CK, Tam YH, Liu KK. The use of laparoscopy in the management of adnexal pathologies in children. ANZ J Surg 2000;70:192-5. 30. Yeung CK, Tam YH, Sihoe JD, Lee KH, Liu KW. Retroperitoneoscopic dismembered pyeloplasty for pelvi-ureteric junction obstruction in infants and children. BJU Internat 2001;87:509-13. 31. Cheung ST, Lee KH, Yeung TH, et al. Minimally invasive approach in the management of childhood intussusception. ANZ J Surg 2007;77:778-81. 32. Chan KW, Chow CS, Tam YH, Lee KH. Laparoscopy: an excellent tool in the management of primary omental torsion in children. J Laparoendosc Adv Surg Tech A 2007;17:821-4. 33. Chan KW, Lee KH, Mou JW, Cheung ST, Tam YH. Laparoscopic management of complicated Meckel's diverticulum in children: a 10-year review. Surg Endosc 2008;22:1509-12. 34. Lee KH, Tam YH, Chan KW, Cheung ST, Sihoe J, Yeung CK. Laparoscopic-assisted excision of sacrococcygeal teratoma in children. J Laparoendosc Adv Surg Tech A 2008;18:296-301. 35. Tam YH, Lee KH, Sihoe JDY, Chan KW, Wong PY, Cheung ST, Mou JWC. Laparoscopic hernia repair in children by the hook method: a single-center series of 433 consecutive patients. J Pediatric Surg 2009 (accepted). 36. Lee KH, Yeung CK, Tam YH, Ng WT, Yip KF. Laparoscopy for definitive diagnosis and treatment of gastrointestinal bleeding of obscure origin in children. J Pediatr Surg 2000;35:1291-3. 37. Georgeson KE, Fuenfer MM, Hardin WD. Primary laparoscopic pull-through for Hirschsprung's disease in infants and children. J Pediatr Surg 1995;30:1017-22. 38. Georgeson KE. Laparoscopic fundoplication. Curr Opin Pediatr 1998;10:318-22. 39. Farello GA, Cerofolini A, Rebonato M, Bergamaschi G, Ferrari C, Chiappetta A. Congenital choledochal cyst: video-guided laparoscopic treatment. Surg Laparosc Endosc 1995;5:354-8. 40. Chowbey PK, Katrak MP, Sharma A, et al. Complete laparoscopic management of choledochal cyst: report of two cases. J Laparoendosc Adv Surg Tech A 2002;12:217-21. 41. Ure BM, Schier F, Schmidt AI, Nustede R, Petersen C, Jesch NK. Laparoscopic resection of congenital choledochal cyst, choledochojejunostomy and extraabdominal Rou-en-Y anastomosis. Surg Endosc 2005;19:1055-7. 42. Le DM, Woo RK, Sylvester K, Krummel TM, Albanese CT. Laparoscopic resection of type 1 choledochal cysts in pediatric patients. Surg Endosc 2006;20:249-51. 43. Laje P, Questa H, Bailez M. Laparoscopic leak-free technique for the treatment of choledochal cysts. J Laparoendosc Adv Surg Tech A 2007;17:519-21. 44. Li L, Feng W, Jing-Bo F, et al. Laparoscopic-assisted total cyst excision of choledochal cyst and Roux-en-Y hepatoenterostomy. J Pediatr Surg 2004;39:1663-6. 45. Lee KH, Tam YH, Yeung CK, et al. Laparoscopic excision of choledochal cysts in children: an intermediate-term report. Pediatr Surg Int 2009;25:355-60. 46. Shimotakahara A, Yamataka A, Yanai T, et al. Roux-en-Y hepaticojejunostomy or hepaticoduodenostomy for biliary reconstruction during the surgical treatment of choledochal cyst: which is better? Pediatr Surg Int 2005;21:5-7. 47. Tanaka M, Shimizu S, Mizumoto K, et al. Laparoscopically assisted resection of choledochal cyst and Roux-en-Y reconstruction. Surg Endosc 2001;15:545-52. 48. Palanivelu C, Rangarajan M, Parthasarathi R, Amar V, Senthilnathan P. Laparoscopic Management of Choledochal Cysts: Technique and Outcomes-A Retrospective Study of 35 Patients from a Tertiary Center. J Am Coll Surg 2008;207:839-46. 49. Saing H, Han H, Chan KL, et al. Early and late results of excision of choledochal cysts. J Pediatr Surg 1997;32:1563-6. 50. Tsuchida Y, Takahashi A, Suzuki N, et al. Development of intrahepatic biliary stones after excision of choledochal cyst. J Pediatr Surg 2002;37:165-7. 51. Yamataka A, Ohshiro K, Okada Y, et al. Complications after cyst excision with hepaticojejunostomy for choledochal cysts and their surgical management in children versus adults. J Pediatr Surg 1997;32:1097-102. 52. Koshinaga T, Fukuzawa M. Pancreatic ductal morphological pattern and dilatation in postoperative abdominal pain in patients with congenital choledochal cyst: an analysis of postoperative pancreatograms. Scand J Gastroent 2000;35:1324-9. 53. Komuro H, Makino SI, Yasuda Y, Ishibashi T, Tahara K, Nagai H. Pancreatic complications in choledochal cyst and their surgical outcomes. World J Surg 2001;25:1519-23. 54. Watanabe Y, Toki A, Todani T. Bile duct cancer developed after cyst excision for choledochal cyst. J Hepatobiliary Pancreat Surg 1999;6:207-12. 55. Fieber SS, Nance FC. Choledochal cyst and neoplasm: A comprehensive review of 106 cases and presentation of two original cases. Am Surg 1997;63:982-7.